Weight: Gander: 5.4 – 6.3 Kg. Goose: 4.5 – 5.4 Kg. Useful to Know: Occasionally, the odd grey patch can appear in offspring. This is a fault, although light grey feathers on the back and rump in first year females will fade and is permitted. Photo: Roman Goose owned by Mrs Erica Hughes. Photo Courtesy of Rupert Stephenson. 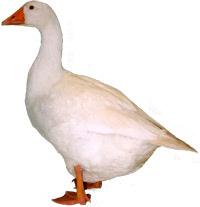 Roman Geese were imported into the UK during the early 1900’s and entered the British Poultry Standard in 1954. They have light blue eyes and orange to pink bill and webs / feet. Some Roman Geese are tufted. Both tufted and non-tufted can be shown in the UK although the American Standard of perfection requires a tuft. They are called Tufted Roman in North America where they were standardised in 1977.